Zebra Antishock H80cm - Polycarbonate bar stool, chrome legs. Suitable for home, kitchen, living room, office, bar, pub, shop, restaurant, hotel, pizzeria, hair salon at the best value for money. ZEBRA ANTISHOCK is a recyclable polycarbonate bar stool, with 4 chrome legs. To be assembled. Size: W51 D53 SH80 H116 cm. 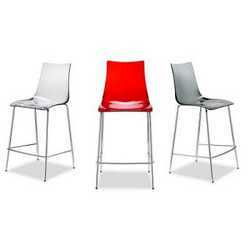 Available colours: transparent, transparent red, transparent fumè, white, black. Minimum order: 2 bar stools.